[singlepic id=146 w=320 h=240 float=right]The ancient town of Ronda (750m above sea level) is about an hour inland from Marbella high up in the mountain range Sierrania de Ronda, hanging over a cliff and straddling a deep river gorge (called El Tajo) that divides the town. It is accessible by a winding road through the mountains of Sierra da las Nieves which today is well kept and although winding it has some marvellous views. Ronda is also serviced by rail from Malaga city for a more leisurely trip. It has a population of over 36,000 and the area is one of Andalucia's top tourst attractions. It is ideal for hiking, climbing, mountain biking and caving. The town also has a rich history stetching back many centuries that makes it a place that must be seen. It's most outstanding natural feature is the 100m cliff on which the city is perched. This cliff is bisected by an equally deep gorge that runs for some 500m and which contains the River Guadalevin at its floor. Connecting the land either side of the gorge is Puente Nuevo (New Bridge) which is definitely Ronda's best known construction. It connects the town's oldest district, the original Roman and medieval neighbourhood and the barrio del Mercadillo (Mercadillo Neighbourhood) which is known as the new Ronda. The original bridge was opened in 1735 but only lasted six years when it collapsed killing 50 people. Construction of the New Bridge started in 1751 and was completed in 1793 and it is largely what we see today. Probably the main tourist attraction of Ronda is the Plaza de Toros one of the oldest bullrings in Spain. Whatever your views on bullfighting the bullring is a beautiful piece of architecture. It is one of the few arena where the public area is covered keeping the audience protected from the sun. The two tiers of seating are supported by a circumference of arches graced with Tuscan style columns. Over the generations the bullring has attracted personalities such as Orson Welles and Ernest Hemmingway. Today the Plaza de Toros contains in addition to the bullring: a Museum with an exceptional collection of Ancient Fire Arms, a Riding School which maintains the Spanish tradition of classical equestrianism, and meeting rooms which are within its historic Library. Around from the bullring is the Alameda-Promenade of the Gorge this is walkway through beautiful gardens and leading to the Parador Hotel and has marvellous views from the cliff side to the plains below and also of the gorge and the Puene Nuevo that spans the gorge. 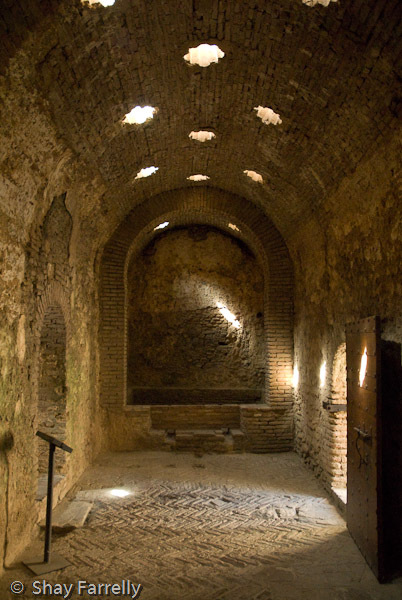 [singlepic id=147 w=320 h=240 float=right]Other attractions include the Arabic Bathhouses - The Baños Arabe, which is situated in the ancient Jewish quarter and were built in the late 13th century. These were discovered again in 1935 and parts have been excavated when the land was taken over by the State. They are well worth a visit. The Palacio de Mondragón (Mondragón palace), now holds the Museo de Ronda which has an ethnographic tour of Ronda’s history and landscape and a full illustrated map of the sierras, from the Neolithic Age to Iberian and Roman times. The Palace’s patios are remarkable. Not far away is the Peinado Museum which features a large collection of the work Peinado a close friend and follower of Picasso. There are plenty of other historical monuments, buildings and churches to keep you busy. But Ronda is not just an historical town it is a lively place with plenty of shops, restaurants and tapas bars. However, every time we visited we never seem to get up early enough. We would arrive have a meal and then it was siesta time. By the time siesta was over we would have to start home again. So a couple of years ago we decided to stay over a couple of nights and I selected a restored Finca about 4km from Ronda that I had seen featured on a TV programme. The programme showed the complete restoration and I thought I would like to stay there. I eventually found it on the internet, Finca La Guzman. It's a secluded renovated farmhouse surrounded by 5 acres of working olive groves. It was a great relief that the kids were so impressed when we arrived that they asked could we stay there for the whole holiday. Though I think it was the assortment of dogs that they owned plus the swimming pool and the ice creams and drinks from the honesty bar that really attracted them. It was a very well restored farmhouse with nice size rooms and facilities with a lovely breakfast. 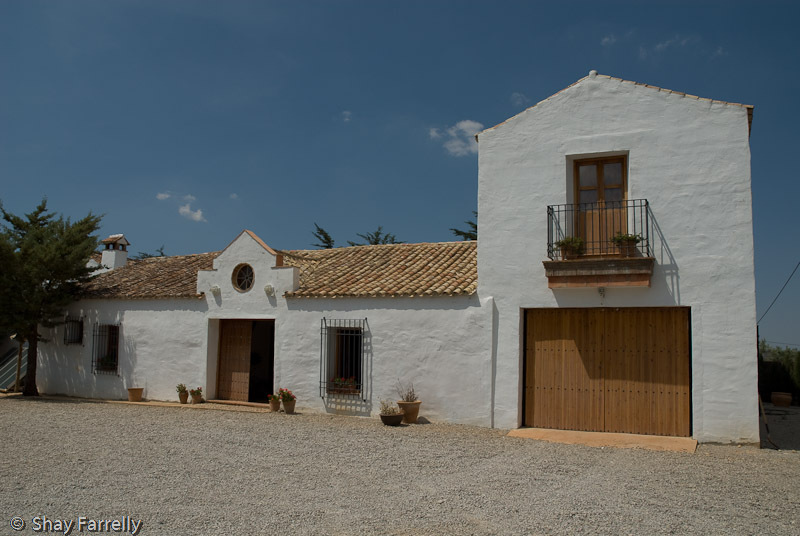 I would highly recommend a visit to Ronda and no better place to stay than the Finca La Guzman, which is only a short drive away from the town.